Seating is general admission, first come, first served. We encourage you to arrive early to allow enough time to move through security and to have the best seating options. Please note there are some obstructed view seats in the balcony of our sanctuary. Programs, prices, and dates are subject to change. To purchase tickets online or by phone, please refer to the “How to Purchase” section located on each event’s page. Ticket providers and phone numbers vary by event. Additional fees may apply. All ticket sales are final and non-refundable. There are no refunds unless an event is canceled. If you are unable to use your tickets, you may transfer them to another person. To transfer a ticket, contact the appropriate program department. We do not keep a wait list for sold-out events. We do not condone purchasing or re-selling tickets through third-party sites. Invalid tickets sold through third-party sites will not be honored by Sixth & I. Ticket age limit: All guests two years and older are required to have a ticket. Unless specified on the event page, events are all ages. Door and Box Office times are noted in the “Doors Open” section on each event’s page. Sales: Only tickets to that evening’s event may be purchased at the Box Office, if the event has not sold out. Will-Call: Pre-purchased tickets may be picked up only on the day of the event when the Box Office opens. A valid photo ID that matches the name on the credit card used to purchase the ticket(s) is most often required for pick-up. Building Entry: Event signage will indicate where to line up to enter the building. Photo Policy: Photo policies are at the artist’s discretion and vary for each event. Flash photography, professional cameras with detachable or zoom lenses, video equipment, Go-Pros, selfie sticks, and tripods are not allowed. Generally, photos are permitted with non-professional point and shoot cameras and cell phones; restrictions may apply. Video/Audio Recording: Video and/or audio recording of events by audience members is strictly prohibited. Sixth & I Video/Audio Recording and Photography: Sixth & I programs may be filmed, audio recorded, and/or photographed for archival and/or other purposes. Your attendance in the audience shall be deemed your consent to appear in such recordings/photography without compensation of any kind. Press: If you are a member of the press interested in covering an event, submit your request at least 24 hours in advance to Michelle Eider. Press passes are limited and subject to the approval of the artist and Sixth & I. Press passes are not granted on site without prior approval. Accessibility: Sixth & I is ADA accessible. 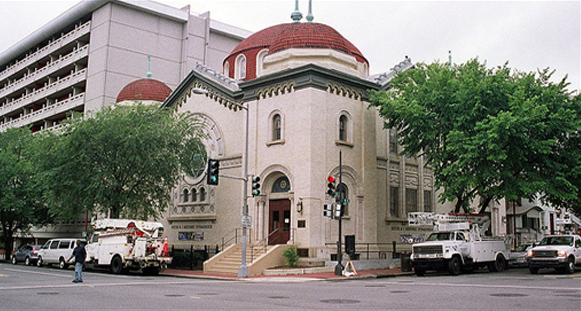 Our accessible entrance is located at 606 I Street, NW. It is helpful to call ahead, 202.408.3100, to make arrangements. Sign Language Interpreter: If you would like to request a sign language interpreter for the event, contact the appropriate program department at least two weeks before the event date. Lost and Found: If you lost an item, please call 202.408.3100 during business hours to see if it has been turned in. Lost items are kept for a maximum of 10 days. Directions and Parking: Sixth & I does not have a parking lot. For information on how to reach us and suggestions for nearby paid parking lots, click here. Pets: Only registered service animals are allowed inside the building. Sixth & I is committed to providing a safe and secure environment for our guests. We reserve the right to refuse entry, or remove anyone from our premises, in our sole discretion. This includes, but is not limited to, anyone who is intoxicated, disruptive, threatening, or refuses a security screening. All guests and bags will be searched upon entry. Guests may be asked to provide identification, remove hats, coats, scarves or to empty pockets for examination. To speed up the security screening, please leave prohibited items (see below), valuables, large bags, and other unnecessary items at home. Due to the historic nature of our building, food, beverage, and water container restrictions apply (see below). Prohibited items will be denied or confiscated. Confiscated items will be held for retrieval after the event. No smoking or illegal substance use of any kind is permitted on the premises, including the use of e-cigarettes and vaporizers. Law enforcement personnel should contact Brian Graber prior to the event. Sixth & I reserves the right to alter our security procedures, policies, and prohibited items at any time. No outside food is allowed to be eaten in the building. Only approved plastic or metal water bottles and drinks served in a Sixth & I tumbler are allowed into the sanctuary. Food allowed: Unopened factory-sealed snacks, whole fruits, gum, candy, and empty plastic food containers as long as they fit in the guest’s bag. Beverages allowed: Water is the only liquid allowed in a sealed plastic water bottle. Unsealed plastic or metal water bottles need to be emptied before entering the premises. A water fountain is located on the lower level. Food and beverages not allowed: Anything that could be easily opened and eaten during the event, such as to-go containers, opened snack items, as well as any allowed food items that do not fit in the guest’s bag. Beverages like tea, coffee, and soda are not allowed into the building. All glass items are prohibited, including glass water bottles and food containers. Guests may be asked to provide identification, remove hats, coats, or scarves or to empty pockets of all items so they can be examined. We discourage bringing food, food containers, and liquids into the building. Prohibited items will be denied or confiscated. Sixth & I is not responsible for any confiscated items. Confiscated items will be held by security for retrieval. Sixth & I reserves the right to alter our security procedures and prohibited items at any time. Food allowed: Outside food allowed into the building cannot be eaten in the building and must remain in the guest’s bag. Beverages allowed: Water and other non-alcoholic liquids are allowed in reusable leak-proof water bottles. Glass water bottles and unopened wine bottles are allowed. Beverages not allowed: Disposable coffee cups, open soda cans or any liquids in a container that could easily spill and damage our historic building. Policies may differ for specific religious programs and classes. If you have questions, please contact the appropriate program department.